Recently released on the Xbox Live “Indie” games section, I was asked to review Jump ‘n’ Bounce for Retro Garden. 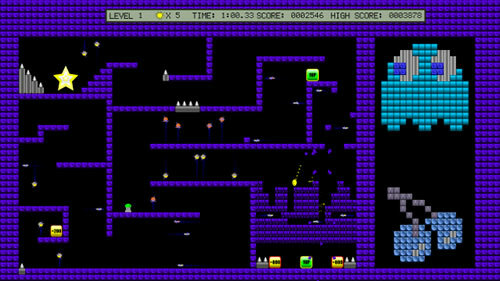 Jump ‘n’ Bounce is a game available on Xbox Live’s Indie’s platform by DeRail Games, the game features 50 levels of bouncy ball action, with a distinctly retro feel. The designers are looking to push it as part of their “New Retro” range, that’s all well and good but what it is like to play? Well the game involves a perpetually bouncy ball, that is constantly bouncing up & down. 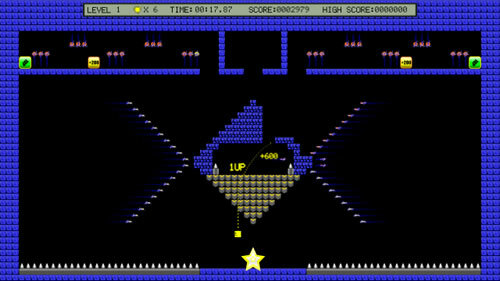 You have to navigate 50 screens from the starting place to a gold star located on the level, which are one screen (or sometimes half a screen) in size, past enemies which are spikes & moving enemies, as well as annoying one way platforms. Luckily you’re not alone, with 1ups & save points shaped like Sonic the Hedgehog beacons helping you on the way. By turning your bouncing ball into a weight, you can destroy some blocks. Although you’re constantly bouncing, you can change your bouncing trajectory, either by bouncing quicker, or by double bouncing in the air. You’ll need to use both these skills to advance in the game. But what of the game? Well the levels are aimed at the retro gaming crowd with graphics and a variety of chiptunes, which vary in toe tappingly awesome to distinctly average. I kind of wished they kept the more bouncy (no pun intended) tunes in & use them multiple times. Though that isn’t the only retro thing about the game, with famous retro video games characters appearing within the game. It’s also incredibly tough and unforgiving. You see, the game doesn’t have much in the way of help beyond a small “instructions” screen and the powerups mentioned above, you’re left to figure out the puzzle, some are speed runs (which the developers admit that they’re targetting with some levels), some have split screens with dark platforms, some are just incredibly tough. That being said, whilst tough at times, it’s genius, often with clever ways of solving the more impossible levels, and also controls are rock solid. In games that require pixel perfect bouncing, it’s reassuring to know that if you die – and you will die a lot – it’s not the games fault, it’s your fault. All in all, it’s a solid & enjoyable game. I haven’t deleted from my Xbox, and at 80 Microsoft Points it’s a steal. It’s not going change the world, but it’s a perfect game to play when your internet’s down. Jump ‘n’ Bounce is available to buy now from Xbox’s Indie Marketplace today for 80 Microsoft Points. The indie section is full of hidden gems.